COLTON – In what was the first league meeting of the season, Colton squared off with the Sheridan Spartans Tuesday, Dec. 11 to establish an order in the Tri-River Conference (TRC). 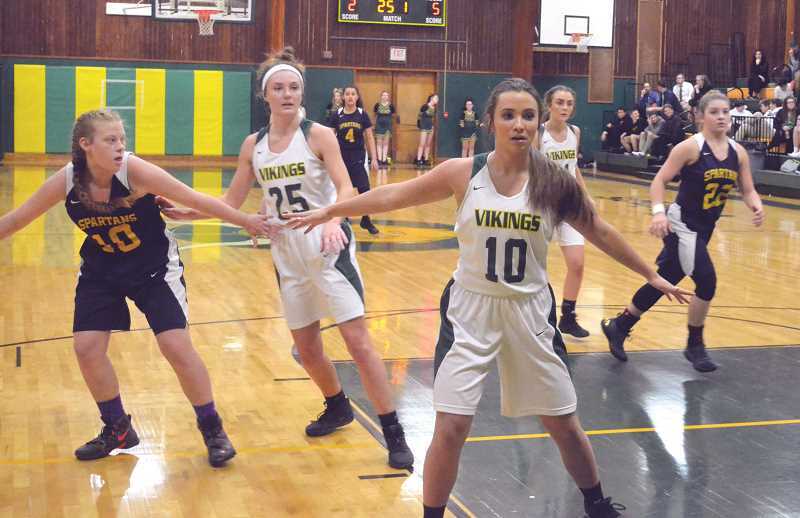 In what was an entirely lopsided affair, the Lady Vikings rolled over the visiting squad 57-22 after 32 minutes of play. Colton set the tone right away, jumping out to an early lead and continuing to pile on the points throughout the first half. In the first quarter alone, Colton put up 17 points against the Spartan defense, while allowing only a single basket. Junior Maddie Beguelin had six points in the first, and senior Kaelie Gates had four points. A theme that developed in the first quarter that was present throughout the rest of the game was steals that led to fast break points. Colton recorded 24 steals in the game, and when they were unable to get the ball in on the first try, recorded 17 rebounds. In the second quarter, Colton put up 22 points against the overmatched Sheridan defense. Among those 22 points was the only 3-pointer of the game, courtesy of senior Maddie Travis to start the quarter. Sheridan made a handful of free throws, but Colton took over late in the half, making eight of the last nine baskets of the quarter. "We brought really good energy," Colton coach Kyle Gilstad said. "Our defense led that first half for us, it gave us a lot of easy opportunities. We didn't have to work so hard in the half court. That same energy kind of brought us down in the second half. We took our press off, and the girls got a little lackadaisical in the half court stuff, and we gave up a little bit of easy stuff. But it's hard to stay super pumped up in a situation like that. It's understandable to go from really high intensity to a slowed down. It's something we can work on. In the third quarter, Colton took its foot off the gas only scoring 12 points and leaving the quarter with a 51-17 lead. In the final quarter, Colton had done the job, finishing with a 57-22 tally. Three of the Lady Vikings had double digit scores: Gates had 12 points, senior Jenelle Baker had 10 points (with 21 rebounds), and Beguelin had 10 as well. Gates and junior Madi Olsen led the team with five steals apiece. "We had a lot of scoring," Gilstad said. "It was spread out. Everybody had two or three assists, four or five steals, it was a real team effort, and everyone stepped up to fill those voids that were left with those two missing girls (Becca Burge and Olivia Haines on family vacations)." With such a dominant performance, Gilstad wants to continue to develop the bench players who stepped up in a big way for Colton against Sheridan. "We got to help develop some of our bench players so they can help develop later in the season," Gilstad said. "There's a lot of bits and pieces with that, including different rotations with different people in. I think that's going to benefit us with seeing different people on the floor and what they can do together." 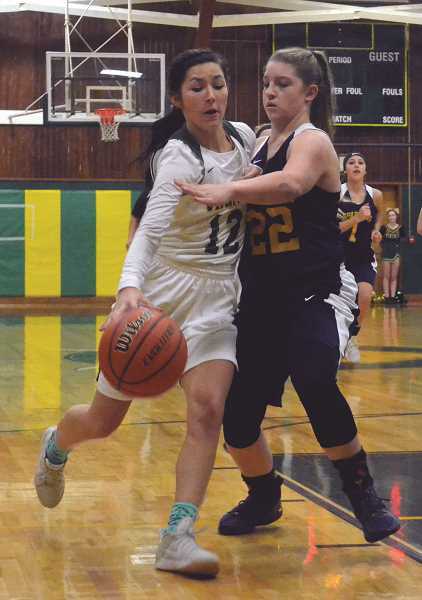 After the win, Colton stumbled against Monroe (6-1) on Friday, Dec. 14 by 54-26, and again to Portland Adventist Academy (3-3) on Saturday, Dec. 15 by a score of 34-24. Colton (3-4) has a chance to turn things around against TRC foe Kennedy (2-0 in TRC, 8-0 overall) on Monday, Dec. 17 after the Pioneer goes to press.